Home » ★★★★☆ » Trinity. Cream of Clapham. It’s the unfairness of it that rankles. And it’s not like I haven’t dragged myself across the river to Clapham twice already in the last six months, both times to visit the epicentre of current culinary derring-do that is The Dairy. It doesn’t seem entirely fair that the good burghers of Clapham have not one, but three restaurants I’d be happy to eat at any day of the week. I really shouldn’t have to cross the river to get the sort of neighbourhood restaurant that I want, but until either Trinity, The Dairy or The Manor decide to open a branch in Paddington, that’s how it is. Meeting J, who knows more about chefs than they have cooked hot dinners, I am delighted to be losing my Trinity virginity in the company of a committed regular. J, possibly the world’s best listener, has, amongst his other accomplishments, written numerous celebrated chef-autobiographies and knows how to tease out a story. I am sorry to observe that I am talking about myself quite a lot and the dial is stuck on Radio Me. I try to change the channel as J has much better anecdotes, but I end up spilling the beans. The menu is seasonal and short. There is a tasting menu but that is too ambitious for a Monday night. Ignoring the no fish on a Monday stricture we both choose the seared mackerel. 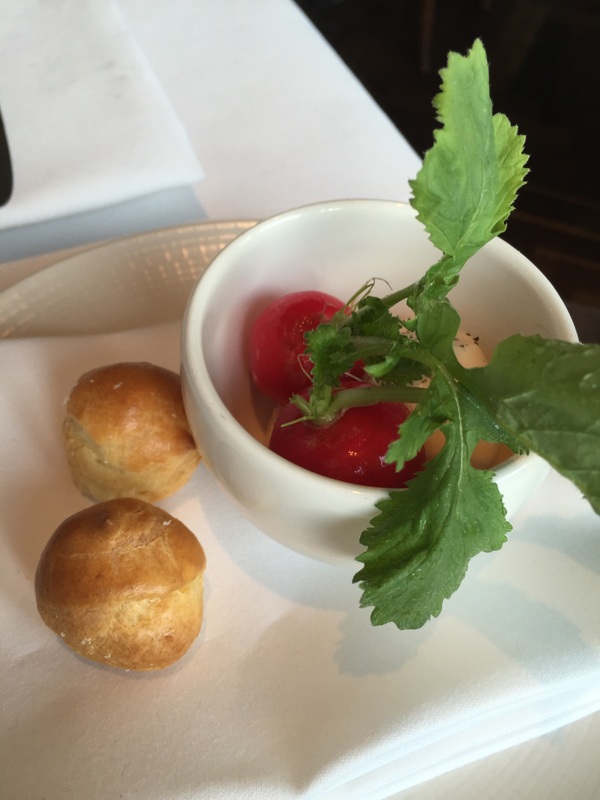 Before we get a chance to try it, we are brought some crisp radishes, with a homemade mayonnaise, to which my memory is adding a hint of seafood. 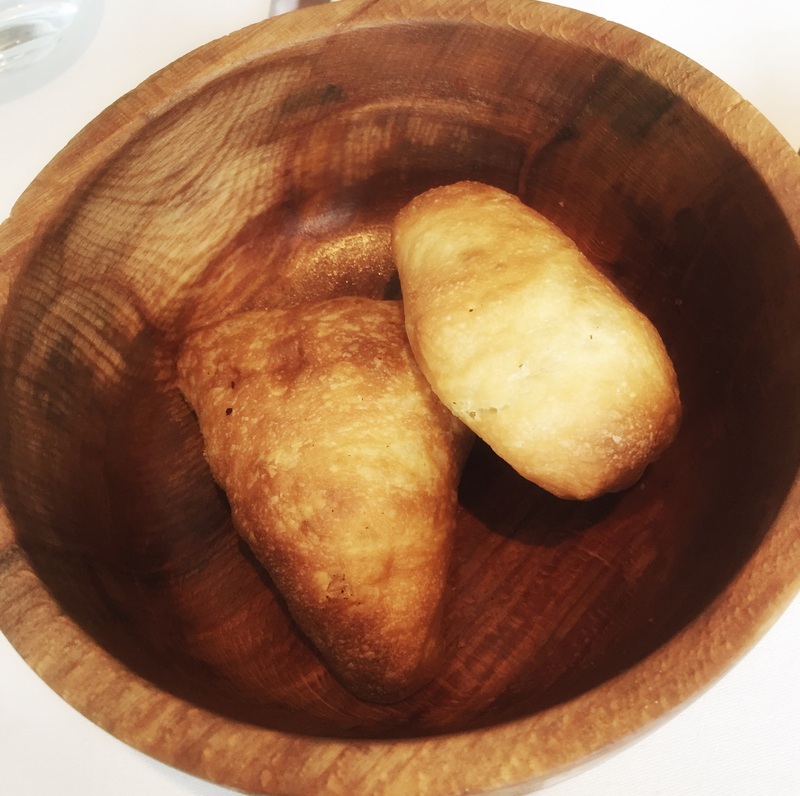 On the side, two fresh-out-of-the-oven gougères, filled with warm soft cheese. There is also fresh-baked crusty bread, with whipped cheesy butter on the now obligatory stone. J is not eating all of his bread and so I do a bit of mirroring and leave some on the plate. This is made easier by the arrival of Spring minestrone, which I spied with my little eye on the tasting menu, the one which we did not actually order, although with all the extras we might as well have and I am not actually complaining you understand and it is as if they have read my mind when they bring all the things I really want. Said mind is immediately diverted by the sight of the bright green broad beans in the soup, as these are my first of the season and allow me to believe in the reality of Spring. 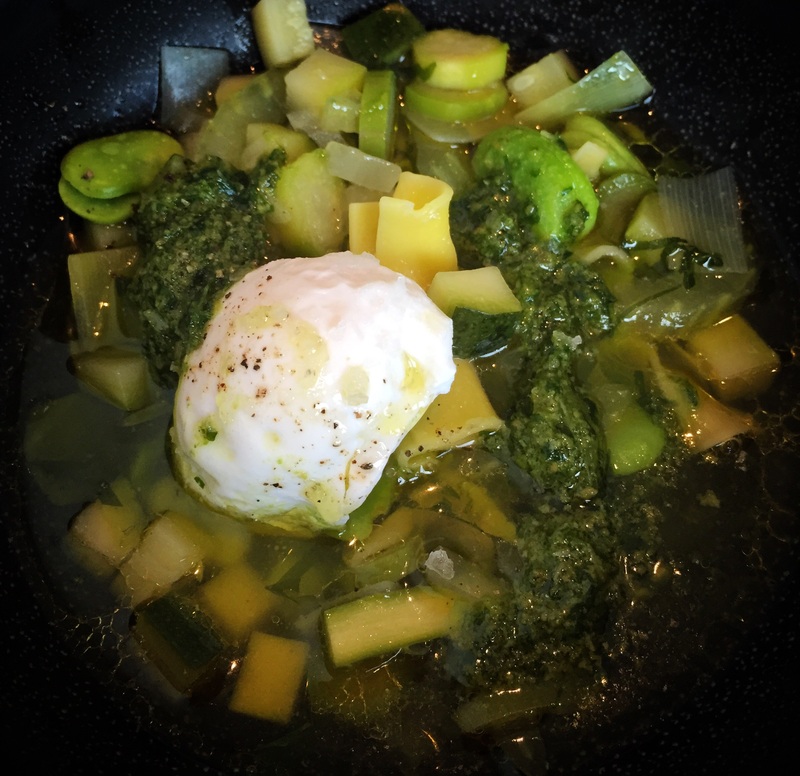 The soup is a simple, tasty minestrone of green vegetables and a little pasta, with a wild garlic pesto of a subtlety which is unusual. Wild garlic. Sounds so lovely but it’s a thug in the kitchen. We are also given a bowl of charred padrón peppers. There is never a time when I’m going to be unhappy about that. I like J because he sneaks in an extra course: the pig’s trotters, a signature dish. 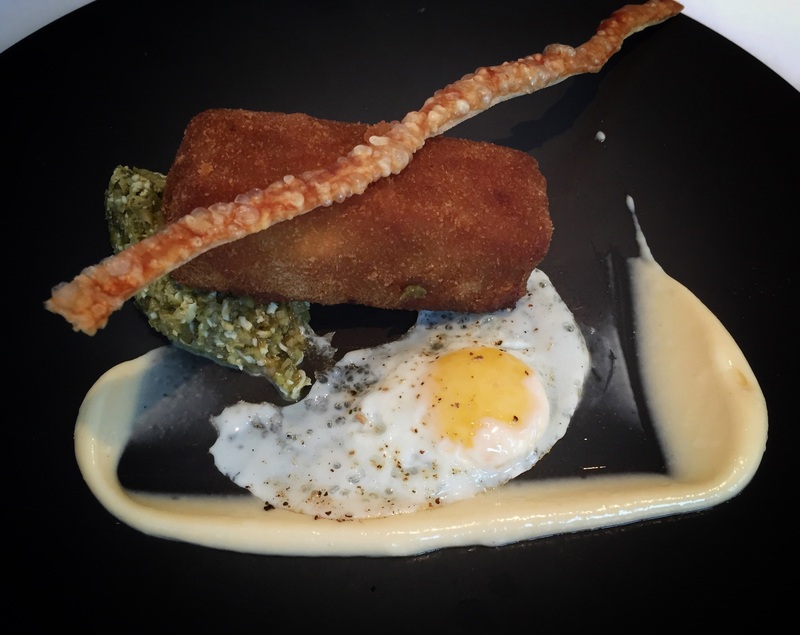 The trotters are chopped and mixed with ham hock and served as a rectangular deep-fried croquette. A piquant sauce Gribiche, with chopped egg, mayonnaise capers, chervil and gherkins is a perfect companion. There is some cracking crackling and J leaves his half of the stick of joy. I do not eat it, even though it is my favourite part of the dish and I look on with sadness as it is removed from the table with the remainder of the bread. My unusual reticence is explained by my desire not to appear as greedy as I actually am to someone I know only slightly. 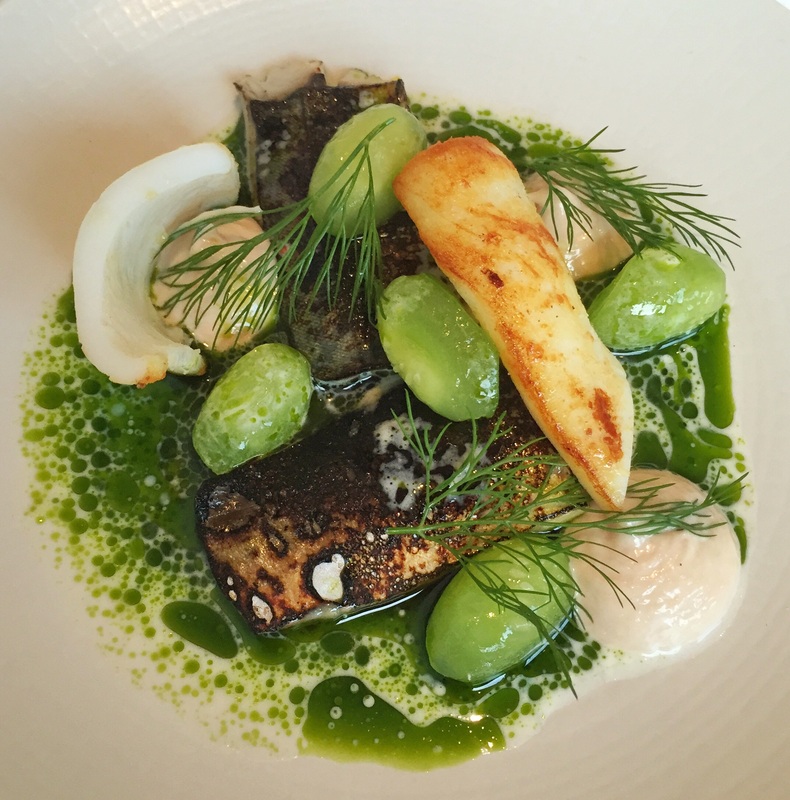 The mackerel we have both ordered is so pretty I stop and stare at it. It is a seascape in food. A charred piece of mackerel, surrounded by a green and cream sauce, piquant marinated cucumbers shaped like grapes, grilled squid and blobs of a bonito (tuna) cream sauce. Fronds of dill are draped over, like seaweed and it looks like a still life. Salt and sweet, chewy and soft, rich and sharp, this has it all. We each order fish for our main course and agree that we will do the half-time swap. It’s a risk, but sometimes one has to go outside one’s comfort zone. 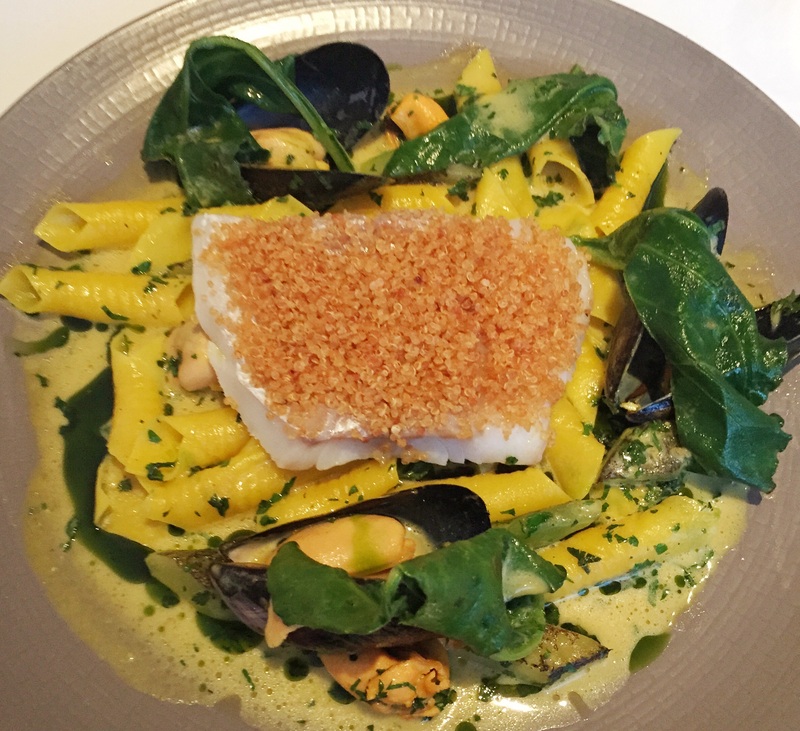 I start with the cod and toasted quinoa, surrounded by delicious homemade saffron garganelli pasta, plump mussels and what might have been sea purslane. The cod steak is translucent and falls apart beneath the fork. I am not wild about the quinoa, as it has no flavour, but it adds texture and crunch. I would prefer the fish to be slightly warmer. 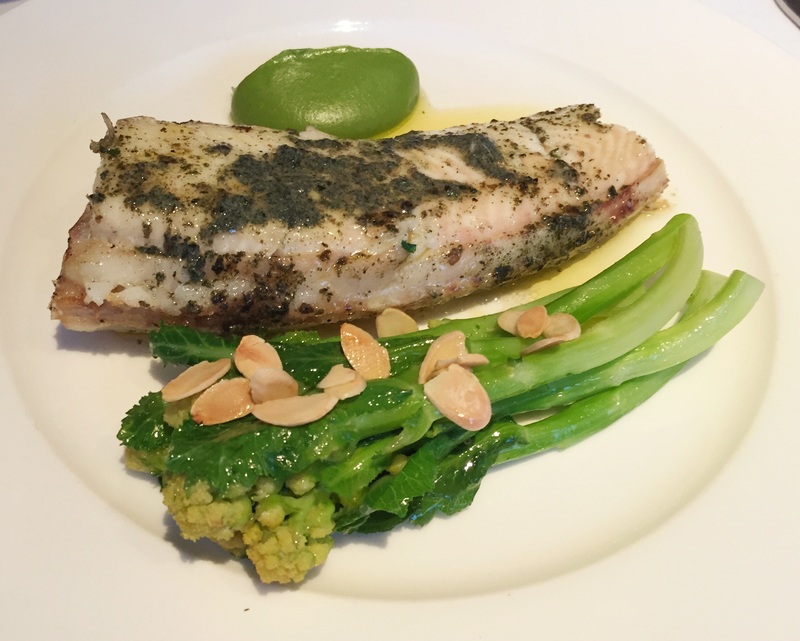 I am sorry though, to have to part with it, for my share of J’s austere-looking lemon sole but oh, how my eyes do deceive because the sole is an excellent piece of firm fish, simply prepared, with seaweed butter in the manner of The Sportsman. In the fish wars, the sole scores more. I do not mention this. We do not order dessert as we are full but, as if by magic and again doing that mind-reading thing, we are brought perfect little copper pots of Crema Catalana, also known as Trinity Cream, a coincidence which I cannot imagine is lost on the chef and following that, a little rose-flavoured macaron, to round off the meal, because by that point we really needed. Summing up :It is fair to say that the beyond-the-call treatment that we received may not have been entirely unconnected to the fact that my dining companion is a regular but we paid for our meal and the £57.25 each, including service and one G&T felt like extremely good value for food and service of this quality. I like Trinity. 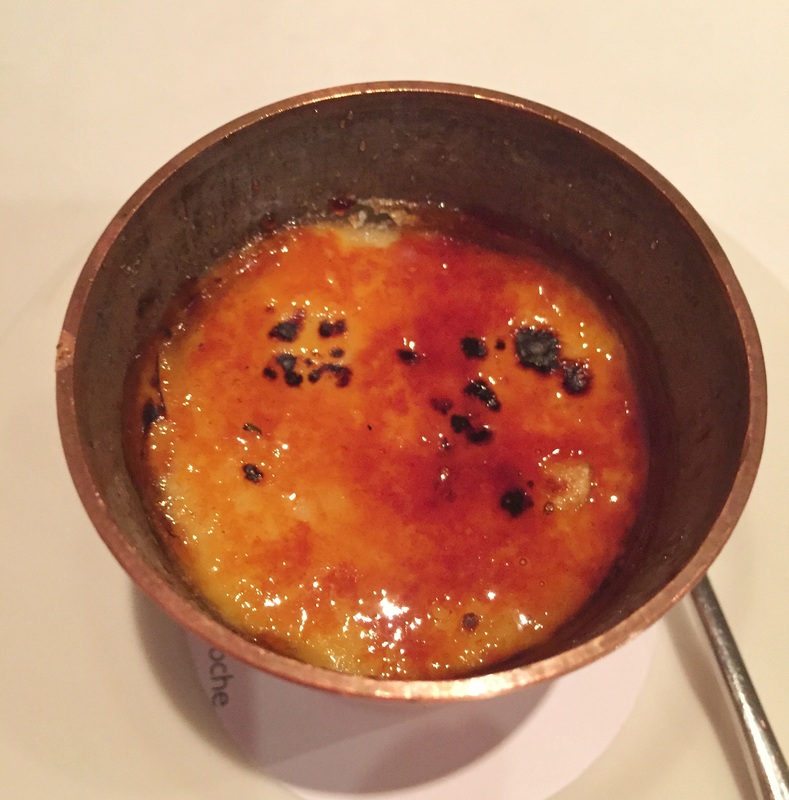 It’s a brilliant neighbourhood restaurant with solid yet adventurous cooking, decent ingredients and great service. There’s only one problem with it. The neighbourhood it’s in isn’t mine. “You can eat the leaves”. Who knew? Bread. Reader, I left some. There are things in life we regret. Full of the joys of Spring. Trotter. Not obviously a pig’s foot and none the worse for that. It’s Keen-wa, surely you know that by now? Because we didn’t have dessert. Wow that looks good. I hadn’t heard of Trinity but it is now firmly on my list. Thanks for the recommendation.